Steven (Chicagoland, United States) on 13 December 2012 in Landscape & Rural and Portfolio. 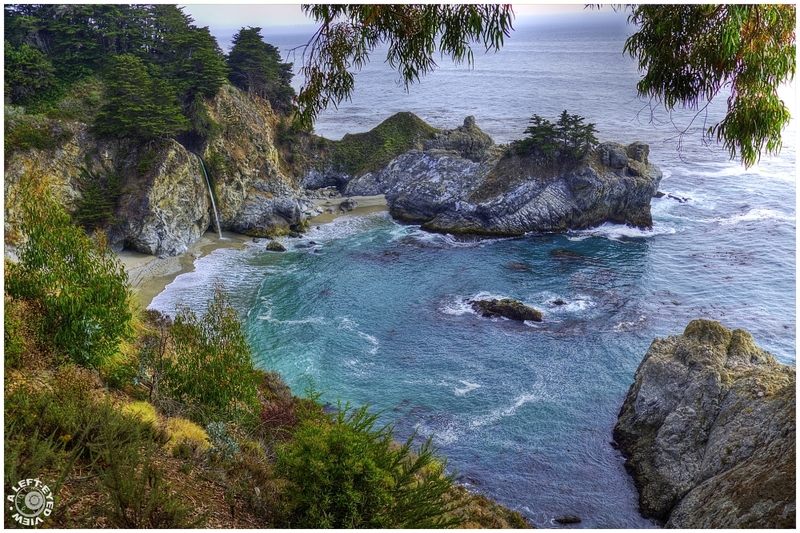 McWay Falls is an 80-foot waterfall located in Julia Pfeiffer Burns State Park that flows year-round. Like Alamere Falls, this waterfall is one of only two in the region that are close enough to the ocean to be referred to as "tidefalls". It is located on McWay Creek and is one of the few waterfalls that empty directly into the ocean. Although it can be viewed via a trail from above, the beach and scenic cove below is difficult to access by land. However, it could be easily reached by boat. Even with this possibility, it is not recommended that people visit the beach as a safety precaution due to crumbling cliffs and to preserve the environment. And if you're caught by law enforcement officials, expect to pay huge fines. Very lovely view from above. Perfect place to spend a peaceful time. I wish you a wonderful Christmas in advance Steven. Have a gorgeous holiday! Beautiful framing of the fall. Das sieht gut aus mit den unterschiedlichen Farben des Wassers. Wonderful place! Have a good day. A great catch under the circumstances, fantastic range of colour in the shot. This looks to have everything in the one place ! What a spot to find. Gorgeous scenery and lots of dynamic range in colors. Gorgeous colors and I love how you framed this shot. This iconic shot in Julia Pfeiffer Burns State Park could be one of your best, Steven ... so far. I can see this hanging on one of your walls! @Judy aka L@dybug: Many thanks, Judy! A beautiful photo of this wonderful place. A gorgeous image that combines the trinity. Subject, composition, and light. Wow! What a beautiful place! It looks like it would be a wonderful place to sit on the beach but with the heavy fines it probably isn't a good idea. Gorgeous image! A scenic spot. I like your inclusion of the overhanging foliage that balances the large negative space of the upper right. Paradisiaque ! Et je vois une petite crique très attirante ! love how you framed the image !